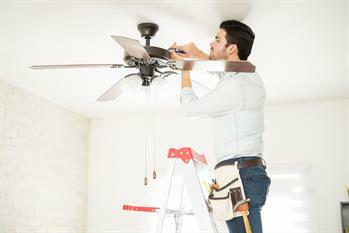 For many homeowners, there’s a common belief that using the ceiling fans should only be done during the summer months when it’s hot outside and they want to cool their indoors. However, this isn’t necessarily the case. There are a number of benefits to using the ceiling fans throughout the entire year to ensure you have the most comfort possible in your home. Here are some things you may not know about having an eco-friendly ceiling fan and how it regulates temperatures. During the summer when temperatures reach uncomfortable levels, you want to find anything that can help alleviate the heat. So you turn on the ceiling fan. This is a perfect option when used alongside the air conditioning to help create the perfect environment. Using the ceiling fans with the air conditioner means neither one must work excessively to help keep your home cool. Instead, you can leave the thermostat a bit higher and put the ceiling fans on low to increase their ability to create a comfortable home. Not many people know this, but the same fan that you use to keep yourself and your family cool in the summer can be used in the winter months to help keep the home warmer. This is because many of the ceiling fans installed in homes have a way to adjust settings and run the opposite direction. When you change the direction in which your ceiling fan is operating and put it on the low setting, you can help circulate the warm air. Airflow is controlled as the ceiling fan pulls the air in and pushes it to the walls and down to your floor. Overall, this creates a warmer home. At Mr. Sunshine’s Home Services, we are dedicated to our customers. You deserve to have a comfortable home no matter the time of year. Because of this, we offer ceiling fan installation year-round in order to keep your home at the comfort level you desire. If you need to install a ceiling fan, get high-quality and expert Goodyear electrical services on your team. We take pride in our quality workmanship and you can see it in every job we do. Call us today at (623) 469-7422 or visit us at https://www.mysunnypros.com/ to schedule your service.